If you enjoy art museums, interactive science museums, pretty lights, music, or the pleasing effect of symmetry, the Mori Building Digital Art Museum Epson teamLab Borderless (what a mouthful!) delivers. teamLab is a consortium of artists, programmers, engineers, CG animators, mathematicians, architects and graphic designers. They pool their talents to create interactive works of magic straddling the line between the beautiful, the captivating, and the technology needed to create it. teamLab has two installations in Tokyo: Planets and Borderless. This article covers the Borderless museum at the Mori building, more than 10,000 square meters with digital art that’s constantly changing, morphing, and interacting with spectators. Word has gotten out about how amazing this place is and like most famous works of art, it is popular. In most cases, you’ll need to buy tickets ahead of time or risk them being sold out on the day that you want to go. Tickets cost ¥3200 per person and can be purchased here. I spent about four hours exploring the exhibits at teamLab and had I not been so jetlagged, I probably would’ve stayed for even longer. Each room constantly changes and might be a completely different experience at one time of day than another. Part of this is because of who might be in there and how you might interact, and how the colors and sounds change in each room. Whether you go in early, right after it opens, or later in the afternoon, allow yourself at least a few hours to see all of the exhibits and to not feel rushed. *Closed on the 2nd & 4th Tuesdays of the month. 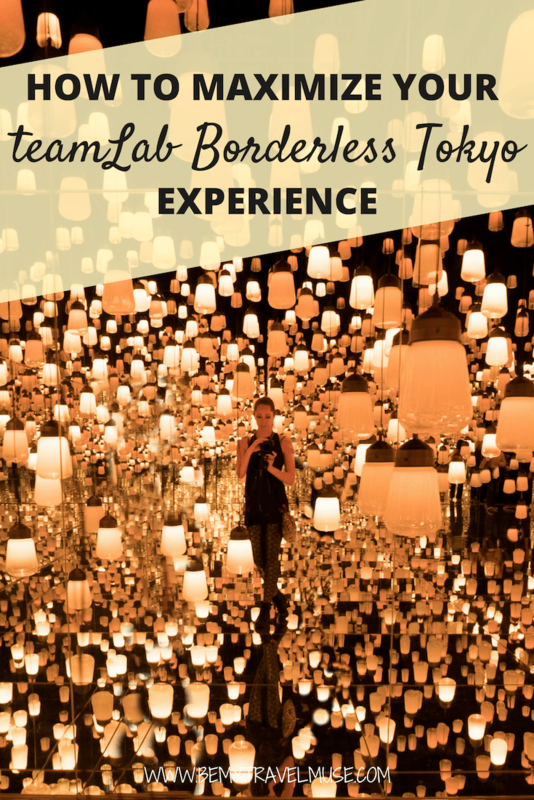 Many of the famous photos that you might have seen of teamLab Borderless with only one or two people in the photo were taken by teamLab itself. Make peace with the fact that there will be people in your photos. If you do see a short line for one of the more popular exhibits, and you’ll know because there will be a queue set up, go in while the getting is good! I was also unsure of how best to time my entry to the building. I went close to opening time and stayed until the early afternoon. In an email from teamLab on the day of my visit, they suggested coming after 2 PM in order to have smaller crowds or to spend less time waiting in line. You can encounter lines entering the building for up to 90 minutes or in queues to enter the more popular exhibits. That said, Google told a different story as I scrolled through for the popular times. So basically, plan on sharing the experience with others no matter when you go, although if you wait until closing you might be able to get one or two photos without others in them. Although you will be exploring with plenty of people, I found that Japanese culture is polite and not pushy, which made it a more pleasant experience. teamLab also encourages seeing other people as part of the art. In an interview with designboom, they say that unlike in a traditional museum where being alone is a blessing, in Borderless you may pay more attention to the action of the viewer next to you, since the art is interactive, than you would looking at a traditional painting. teamLab wants visitors to experience the art together and to interact with it both individually and as a group. They view this as an important unifying factor both of art and of the effect of people living in cities. If only there were interactive art all over the subways and crowded streets, perhaps we play with each other a bit more! Also, make sure you eat beforehand. Apart from a tea room, there is no food or drink at the museum. There are little rest areas with vending machines but that’s about it. Make sure you eat before you go! In the video above, I take you through each room and each sensory experience. Below I’ve listed each place so that you can make sure you don’t miss anything! These dazzling lights look like falling crystallized rain, constantly changing colors and framed with mirrors on the walls and floor. Spend some time in here and wander through the corners and you just might get lucky and find a spot where you can get a photo without too many other people! This is the most popular exhibit and the only one with a time limit when I went. The lightbulbs change color if you come near them, and the whole room goes from yellow to pink to blue. About 30 people are let in at a time and only for a minute, and you may wait for about 20 to 40 minutes to get into this one. This will probably be the first room that you come into. There are little standing rooms within this giant room with additional installations inside, but the main feature are the flowers that are blooming, wilting, and sprouting up as you step on and tap on them. I really liked this experience, drinking the blooming tea and watching as the pedals scattered as I drank more. There’s an additional charge for this one of ¥500 which allows you to select from an array of green teas (I picked Yuzu). First this room starts off with stalks high above your head and the sounds and colors change to symbolize the different seasons. As you walk through the room you can come above the rice paddy. The combination of lights and music in here were so beautiful I almost cried. It may have had to do with my extreme exhaustion from flying all night but it was beautiful just the same. This reminded me of the famous Japanese waves painting, animated and come to life. It’s calming and stormy at the same time. There are some pillows in the middle of the room if you need to take a load off. If you want to double over from the cuteness overload head to the Athletics Forest and watch the kids interact by jumping on the trampolines and stomping on the flowers. You’ll see flowery humpback whales swimming by under your feet and across the walls. You can also find some exhibits to climb on and a little drawing area too. Just through the Athletics Forest you’ll see these floating balloons which reminded me of little hot air balloons of various sizes. While each room is interactive, the hallways are tons of fun, too. There are marching bunnies and flower animals on the walls, most of which are interactive as well, so hop along with them and touch them. This double decker art show is visible from a net suspended in what seems like the middle of time and space. Lie down and watch as the lights and sounds swirl above underneath and around you. To feel like you’re in a nightclub of lasers, head into this room and dance! If you get lost, connect to the free Wi-Fi and load the pictures from this article to show to the attendants and they will point you in the right direction. As you go through the exhibits it will become clear why they don’t want tripods, selfie sticks or big backpacks – some of them have narrow areas and for some you’ll be climbing, jumping, and walking through hanging lights. I was a little bit bummed that I couldn’t bring a tripod since I was there alone and wanted to get some photos with me in them, but I was able to use the mirrors for selfies, and in a couple of cases was able to ask someone nearby to take my picture for me. Problem solved! Thankfully teamLab borderless at the MORI building is easy to find. Get off the train at the Aomi stop and turn left as you exit the train. You’ll see a mall with a Starbucks downstairs and the Toyota showroom to your right. Walk through the showroom and you’ll soon come to the entrance of the exhibit. 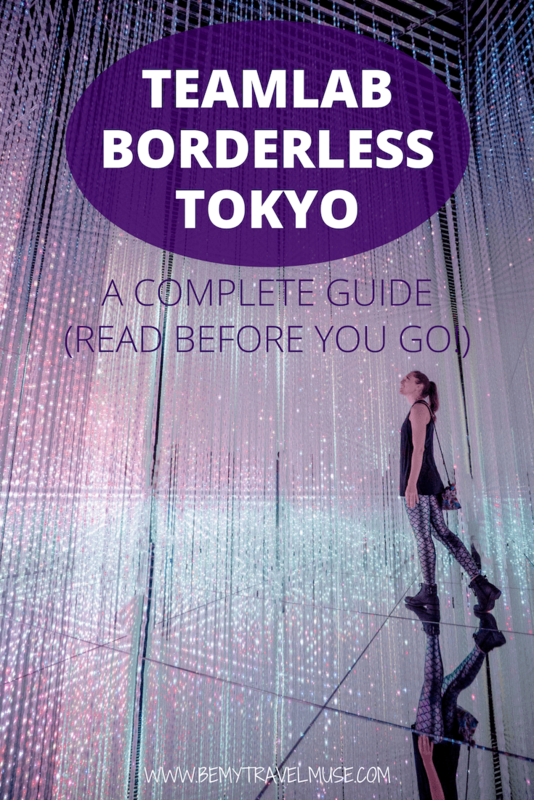 I hope this guide helps you to enjoy the experience at the Mori Building Digital Art Museum Epson teamLab Borderless (say that ten times fast. I’ll wait). If so come back and let us know! There are some similar exhibits in Singapore and there was in LA too! They often travel. Such a stunning photos! It seems unrealistic but I know it’s real. Thank you for sharing your travel blog. It makes me travel and discovers the world too. Thank you for sharing! I’ve already purchased my tickets! May I know how long did you have to wait when you went near opening time at 10am? I more or less got right in. Each day will differ I’m sure. I loved the music in the rooms, most of all during nest room. Do you happen to know what its called or a possible soundtrack? Oh dear I don’t know anymore but maybe you can Shazaam it? Definitely go early, and ignore the email that says go around 2pm. I arrived at 10am on a Monday and we waited maybe 20 mins to get in. I’d say try to get there at 9:45am. We were able to get inside the first doors in just a few minutes. When we left at almost 3pm the line was outside and wrapped around the building, probably over an hour wait. This article doesn’t actually tell you how to optimize visiting the top locations first. When you first go in, DON’T go upstairs to the athletic forest. If you find yourself there turn around and go back to a different room. Do the nest or the floating lamps as soon as you can. We found the lamps maybe an hour in and were able to go twice waiting < 15mins each time. We didn't find the nest until much later and waited over an hour. You don't necessarily have to make a beeline for these, part of the experience is discovering new rooms as you wander about and skipping them takes away some of the fun. But try to do them within the first hour. The nest is on the right side of the big flower forest room that you first enter into if you have trouble finding it. The floating lamps I can't say exactly… it's more towards the middle and up some stairs I think. The crystal room is also nice but has more capacity so you don't have to wait long to get in. Finally, I don't suggest waiting more than 30-40 minutes for the nest, as you can still see the same show, but standing up, at the cave thing. When you make it into the nest though then try to get a spot towards the middle (subjective, but I think that's more immersive). Don't forget to look to the sides and down though at least once. How funny, I didn’t wait for the nest at all in the mid-afternoon! The hanging lamps might be good to find first, though. I spent a long time looking for those! It’s such a maze in there.